Hey look, there’s my dog. When I was in elementary school I dreamed of winning the Nobel Prize in Mathematics for determining how to divide by zero. My innocent little self didn’t yet know that 1) there isn’t a Nobel Prize in Mathematics and I should have been dreaming of the Fields Medal, 2) the Fields Medal had not been award to a woman until 2014, and 3) dreams that big would not be part of my life. Sorry to disappoint you, 9-year-old self. This depressing message brought to you by the migraine that lived forever. I’m ok, just worn out. Things will be better soon, before this post hits the presses even. March 18, 2015. Tags: Ann Taylor, clothes, shopping, Target, What I Wore to Work Today. 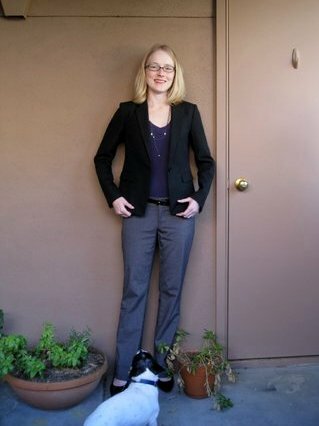 Dog, Links, Pictures, What I Wore to Work Today, Words.